Gives your mouth a cool, clean feeling without interfering with the taste of food and guarantees strong, long holding power. Clean and dry dentures thoroughly before applying Fixodent. 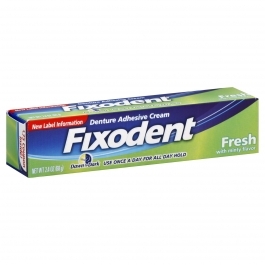 Apply Fixodent to dentures in strips or series of dots. Do not apply too close to denture edges. If oozing occurs, use a little less product. Press dentures firmly in place and hold briefly. You may need to experiment to see what amount of product is best for you. Keep nozzle and cap dry to avoid clogging. To help clean gums, use a soft toothbrush and warm water. Consult your dentist regularly to ensure proper fitting dentures.